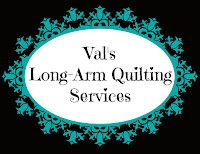 Val's Quilting Studio : Tuesday Archives #194: Mark Your Calendars! This week's theme is: FREE CHOICE! Happy May and happy Tuesday everyone!!! Today's linky is a free choice week. Yep, this week, take advantage to perhaps link your favorite post from the past or even your oldest from the past. I've been busy putting a list of topics together for this month's linky parties anddddd am excited to announce that on June 19th we'll be celebrating our 200th Tuesday Archives linky party! Fat Quarter Shop will be offering a $25.00 gift certificate to one lucky patiticipant that week to help us celebrate. More details to come....but be sure to mark you calendar! I posted May's themes on my sidebar and you'll probably notice I'm in a quilt care/storage mode when you read them. Anyhooo....today also starts my 31 day count down to the last day of school/work. So for a little lunch time "stitching therapy" I'm joining Deb who blogs at Happy to be Scrappy for her A Heart A Day in the Month of May. hearts to practice my creative stitching. I'm looking forward to sharing my progress during Sunday's Slow Stitching linky over at Kathy's. Be interesting to see how this little project progresses, but I can already tell ya I LOVE have a little stitching to do during my lunch break. What a great little heart and a wonderful idea to play with some stitches at lunchtime! A great count down to the end of the school year indeed. Are you going to retire? Or is it only for the holidays? I linked up just blue today, maybe I can inspire you to make one of those? Sorry I am late to the party! Thanks for hosting! This is always a fun place to top by and read posts Val. Amazing how long you have kept this going. Well done!!! Wow, 200 Tuesday Archive post? That's pretty awesome!